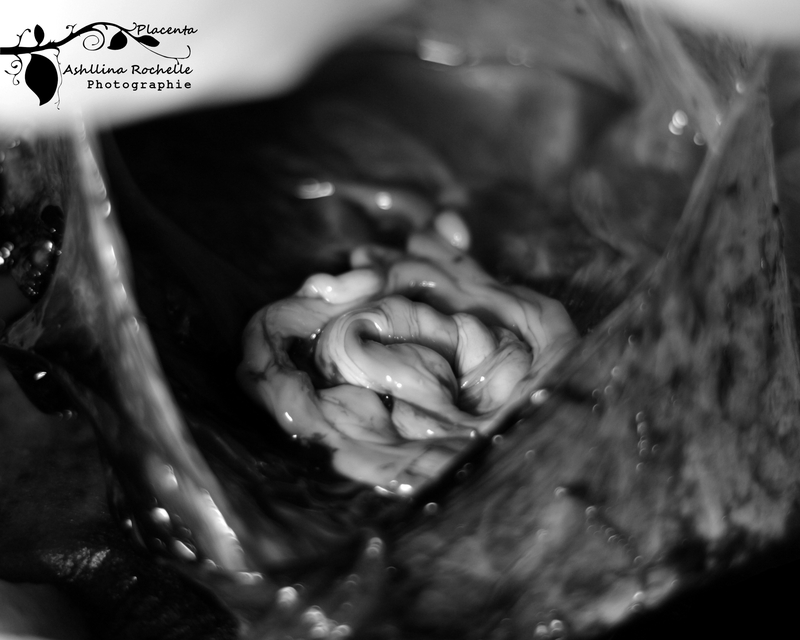 The Placenta is a beautiful organ that nourishes and protects your baby throughout pregnancy. It also plays an important role in the postpartum process and was divinely designed not only for your baby, but for you as well. The customary process of handling the placenta after birth is for it to be discarded as, “Medical Waste.” However, this beautiful “Tree of Life,” which nourished and protected your baby throughout your pregnancy, can continue to share it’s incredible benefits with you and your baby, long after your birth. 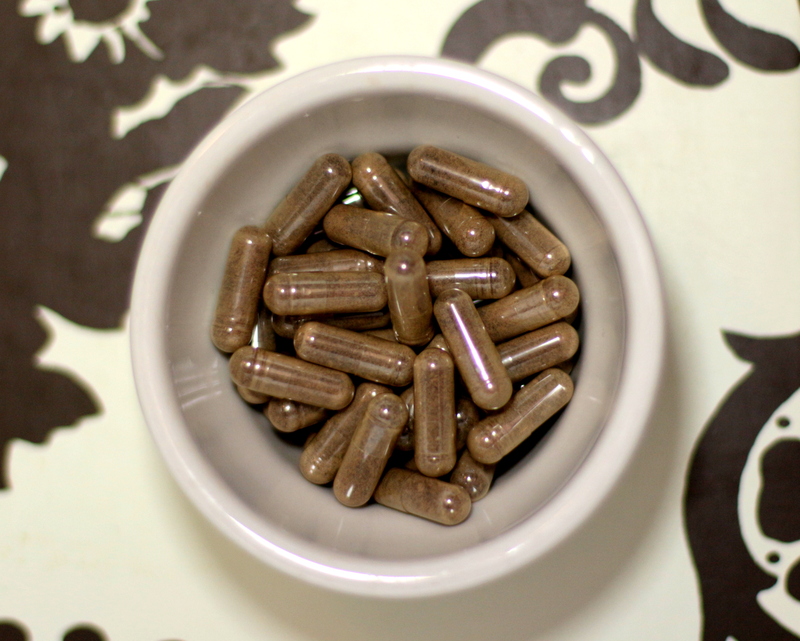 Placenta Encapsulation, or Placentophagy, is the practice of preparing your placenta into medicinal pills/capsules for consumption back into the body. Utilizing the medicinal properties of your placenta, helps to restore your Motherly balance in a natural and spiritual way. For many it can be a very sacred, powerful and healing process, allowing the placenta to continue to nourish and protect you and your baby after birth, as well as promoting a more pleasant postpartum recovery. Most mammals (including primates) consume part or all of their placentas. Consider what a Momma Cat does after the birth of each of her kittens. She eats the sac that each baby kitten is born in and then consumes the placenta, immediately. Many women in diverse cultures throughout history have consumed their placentas for re-balancing their bodies after giving birth. 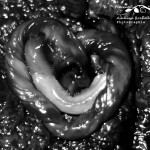 Traditional Chinese Medicine (TCM) has used the placenta for its multitude of healing benefits for thousands of years. Your placenta contains your body’s own natural hormones and iron stores, which remain after birth, as well as your baby’s storehouse for everything your baby needed throughout the gestation period. Your placenta also contains all of the information between you and your baby in regards to your labor and birth process, so it naturally contains reserves of what you both need to recover efficiently. Many women report experiencing more energy, a bountiful milk supply, decreased postpartum mood changes (including postpartum depression), and less bleeding and discomfort after the birth .. overall, a more peaceful postpartum recovery period! 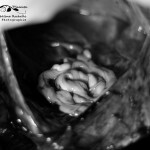 According to TCM, it is imperative that the individual whom is processing your placenta be in a very calm, collected, peaceful and respectful frame of mind while handling your placenta. The energy surrounding the process is just as, if not even more, important than the specific process of encapsulation, itself. 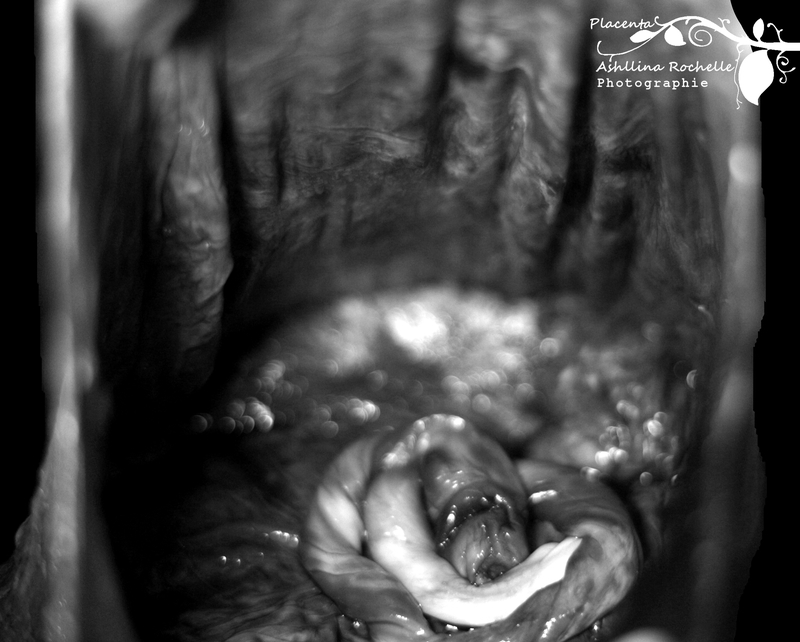 The placenta should be handled with the utmost of care and respect every step of the way. The Encapsulation process requires two – three days of prep and work, back to back. Placenta is gently cleaned, bled-out, steamed, dehydrated (at very specific temperatures), allowed a period of rest, and then ground down into a fine powder to be encapsulated. It is ideal to schedule placenta care services with me at least 6 weeks prior to delivery, to ensure an available slot for services surrounding your EDD, and making pick-up arrangements smoother. 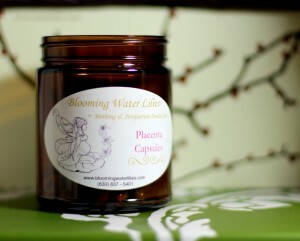 Even if it has been awhile since your birth, you can still experience the benefits of your placenta. 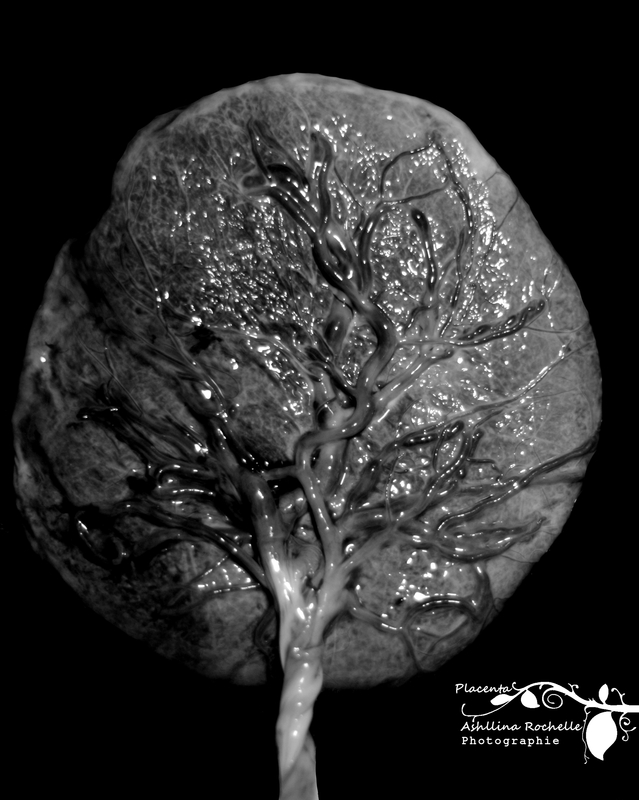 Double-bagged and properly frozen solid within 3 days of birth (Refrigerated within 4 hours of birth), a placenta can be encapsulated even after six months or longer. Blooming Water Lilies will only encapsulate a placenta which has been frozen for no more than 60 days, to ensure no chance of distortion of the internal properties which can be caused by the length of freezer time, or the possibility of improper freezing. If frozen, please thaw the placenta overnight in the fridge prior to pick-up. Encapsulation process will be delayed a full day if placenta is frozen upon exchange. I am often asked by clients if I add, or if I can add, additional herbs to their placenta capsules. 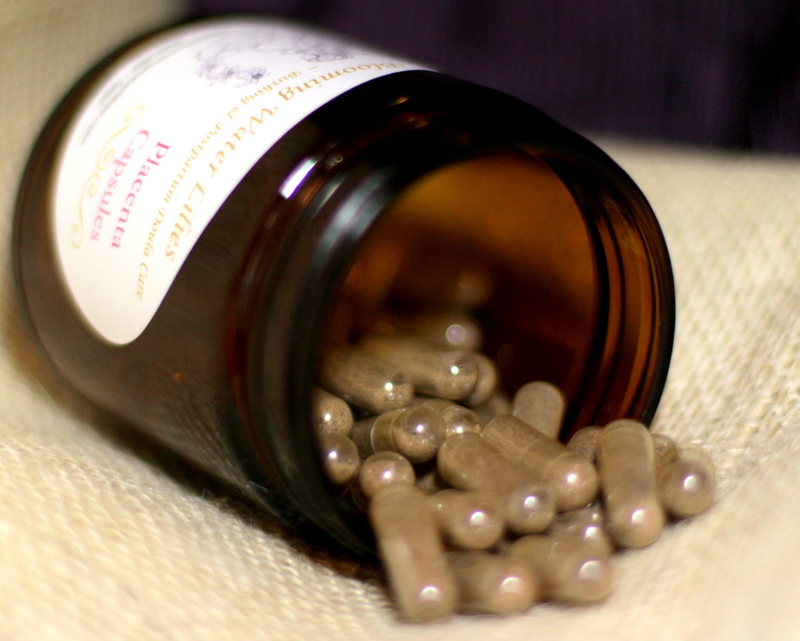 It has become common practice by many encapsulation specialists to add a mixture of dried herbs into the placenta capsules during the encapsulation process. There are many reasons for this, such as cleansing and detoxifying the body, promoting healing, and sometimes particular herbs are added as a means of working as a buffer to actually calm the sometimes strong effects some woman experience from their capsules. Every woman’s body is different and what works for one woman is not necessarily what is right for another. There is no way to know how ones body will respond to a “cleanse” of herbs, especially after such an event as birth. And respectfully, it probably is not the right time to ask anything additional of the Mother’s body at this very vulnerable moment. While there are many benefits to encapsulation, the main purpose of placenta encapsulation is to promote a smooth transition of hormones while the body transitions from a pregnant to a non-pregnant state. 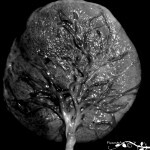 The placenta is made up of everything unique to that Momma and Baby, specifically, and to allow those properties to work as intended, they need to be uninterrupted or “tainted” by anything additional. Should a Mother have a less than desirable response to an herb which was added to her placenta capsules, then the entire placenta has been wasted and is no longer of use to her. Had the placenta capsules and herbal capsules been taken separately, then she can choose on her own how to adjust the amount she is consuming of both and find the right balance for her body’s needs from week to week. It is for this reason that I do not, and will not, add additional herbs to an encapsulated placenta. Should you, as the birthing Mother, desire to take additional “healing or cleansing herbs,” alongside your placenta capsules, I would encourage you to do so on your own. Follow your body and be responsive to what your body is telling you in the process. HB 1670 – An Act relating to the possession and removal of a placenta from a hospital or birthing center. 1) A non-refundable deposit of $75.00 is due to secure placenta care services around your due date. 2) Remaining balance is due in full, after processing, and upon delivery of your placenta care items. Within 24 hours of completing the following information, and paying the deposit, a digital contract will be sent to you for your signature. Contract must be signed within 24 hours of being issued, as the link will expire. Be sure to check your email and SPAM. I often send a text letting you know that your contract has been issued. Please read through the contract completely. Once we have both signed it, you will be immediately sent a PDF copy of the contract. I recommend saving your contract in an important folder within your email server, or printing a copy, to reference on proper storage and exchange instructions immediately after birth. This method of preparing the placenta for encapsulation is inspired by “Traditional Chinese Medicine.” The process involves steaming the placenta gently with proper herbs. Ginger, lemon and cayenne pepper are typically used to open up and encourage the release of properties within the placenta. Putting the herbs in the steaming process is thought to bring out the placenta’s natural healing properties. Lemon being a natural antiseptic, helps to distribute the placenta throughout the body. Cayenne and Ginger, while both warming herbs, have their own specific roles in the process. Cayenne allows a release of the properties within the placenta, rather than being retained and stored by the placenta. The ginger specifically acts as a facilitator for energy and good blood flow. TCM is believed to have tonifying, healing, and warming properties. If your placenta has been frozen, this is always the method of choice. Mother broth from the steam is also an option with this method, for an additional $15.00. This method of preparing the placenta for encapsulation has two options. The first, skips the steaming process all together and the placenta is set for dehydration while still “raw.” The second, skips both the steaming and the dehydration process completely, and the placenta is processed down into tiny pieces and frozen raw, for later consumption. This process is only used within the first 48 hours after birth to ensure freshness. It can be combined with the TCM method so you receive half raw and half TCM (or even 10-15 capsules RAW, and the remainder TCM). Some people choose this method because they are raw food activists and believe the cooking / steaming or dehydration process destroys some of the nutrients. Using the RAW method provides a burst of energy up front but does not often offer the longer, tonifying benefits of TCM. Using TCM also converts some nutrients to be absorbed which would normally be discarded raw. It is very rare, and under specific circumstances, that I recommend either of the RAW method options to a client. Some indications for choosing RAW encapsulation would be: Extensively long and/or difficult labor, postpartum hemorrhage or history of it, or previous difficulties with breast milk production that were not remedied by the care and guidance of a lactation consultant. Placenta capsules are most beneficial to the body when consumed within the first 6 weeks postpartum. The placenta tincture is another way to reap the physical benefits from the placenta besides capsule form. Tinctures are mainly meant for energy, transition, stress, and hormone stabilization. They are great for returning menstrual cycles, menopause, and even puberty. The mother and baby can benefit from the tincture as it has an almost indefinite shelf life if stored properly. Having a remedy on hand for your baby that is made from her/his placenta is like having a bit of a magic potion for the baby. A remedy to use at times of illness, shock, transition or change, and when you intuitively feel it is needed. A life-long remedy for both mom and baby. – Mom: Used during menstrual cycles, PMS prevention, decreased cramping and blood-flow, etc. – Baby: Used for any emotional or potentially traumatic transition such as teething, weaning, sleeping changes, tantrums, and hormone balance during the puberty stage. Tincture may be given to a baby older than 6 months for teething and transition. The tincture is fermented for 6 weeks postpartum, taking over support after the capsule regiment has been completed. The Mother tincture, created after the fermentation process, can then be used for succuss (diluting), extending its life for years and years to come. Utilizing the placenta, raw, in the initial days after birth, is becoming an extremely popular and important step in a new mother’s postpartum healing. Smoothies are highly recommended, when the Mother has had significant blood loss during the childbirth process. This replenishes the body rapidly and restores necessary iron levels by natural and powerful means. This berry smoothie blend contains an abundance of healthy nutrients needed to aid the new mother in her healing process. A tiny thumbnail piece of raw placenta is used and Mother’s report that the taste of the small placenta piece is unnoticeable and the benefits are amazing. This is also a great natural remedy for postpartum bleeding, works very rapidly, and often replaces pharmaceutical means of managing bleeding in a much more natural way. You have options for preparedness of your smoothies. 1) I can prepare a smoothie(s) for you when I come to collect your placenta for encapsulation. 2) I can prepare your smoothie(s) within my home and bring them to you frozen and ready for use at your leisure. 3) I can prepare them for you when I deliver your placenta capsules to you. Smoothies made within your home will require that you provide the necessary equipment, i.e., blender, spoons, trash bag, and an empty and clean sink and working counter space. I can make keepsakes to honor and commemorate the special role this amazing organ played in your precious baby’s growth, development, and birth. Photos are professionally taken, edited and given to you in digital form. Your specific photography requests will be happily honored. Placenta art is made paint free, on archival paper, and laminated. The best prints tend to be made when the placenta has not been washed with water after birth. 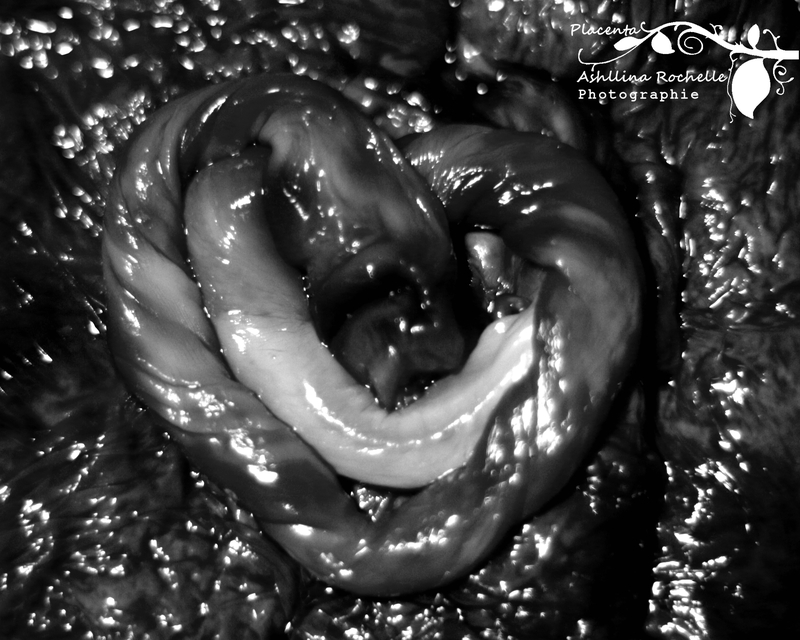 The umbilical cord can also be preserved as a keepsake. There are unlimited options for the cord keepsake: such as a heart, celestial heart, spiral shape, initials, musical notes, or even words (depending on cord length). I can also do custom shapes upon request, but this is subject to the length of the cord which I am working with. Despite a long history of safe use, these statements have not been evaluated by the FDA. These products and services are not intended to diagnose, treat, cure, or prevent any disease. Consult with your healthcare provider if you experience any unusual symptoms. 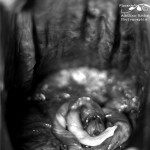 Placental services are not clinical, pharmaceutical, or intended to diagnose or treat any condition. Women and their families who choose to utilize the services on this page take full responsibility for their health and use these remedies at their own risk.